Jazz Hostels has gone international !! Located on rue Ontario at the corner of rue Saint Denis, Le Jazz St-Denis is positioned right in the heart of the Latin Quarter that is known best for its cafes, bars, theatres, boutiques, and artistic atmosphere. Le Jazz is in a charming building over 150 years old, restored but maintaining an antique dcor and an intimate feel. 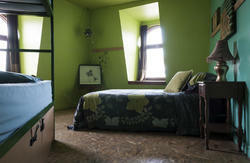 We have both private rooms and dorm rooms available. All of our private rooms are Hotel style and Quality, rated Two Stars, and include Queen bed, small table and chairs and/or a sofa, cable television, free WIFI, telephone, wardrobe, and small refrigerator. We have no curfew; guests receive an access code to enter 24 hrs per day. Le Jazz St. Denis has added an additional location just around the corner - the Castel - with additional dorm and private rooms. It is the perfect setting for large groups, with a dining and lounge area. -Luggage storage room -- free for early check-ins and during room changes. After you check-out or weekly storage: 4 CAD per suitcase per day. 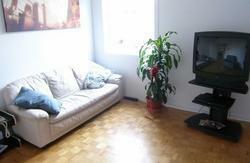 -Lounge with cafe seating, 42 Inch HDTV, DVD player, Lending library; and more! TAXES: Prices shown on Hostelworld do not include the mandatory Quebec and Canadian Taxes. 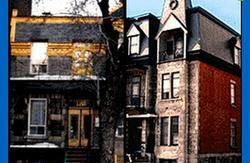 Taxes in Montreal are approximately 19% and will be added to the total when you check in to the hostel. -From the Airport: The most economical way to get from the airport to the hostel is with LAerobus Shuttle. Busses leave from the airport or from the Central/Coach Bus Station every half hour. Travel time is approximately 30-45 minutes. Tickets are $8 each way. Or the shortest route is to find Ontario Est street outside the station to your right and going West (the direction you would walk to cross Berri street) and turning right at the next street, which is St-Denis, going uphill until you see 2099 rue St-Denis on your right. 1) The closest and easiest to walk from metro stop is Sherbrooke on the Orange line. Once outside you will see St-Denis street around the corner walk downhill on St-Denis (south-bound) and shortly after crossing the light at Sherbrooke intersection you should see us on your left at 2099 rue St-Denis. 2) Uphill: A central stop coming from any of the Orange, Yellow, or Green lines stop at the Berri-UQAM metro station. Follow the Exit for St. Denis and once outside walk north on St-Denis (upwards on the incline) at the end of the second block you should see us there on the right at 2099 St-Denis.